The Rat Race: Hockey puck shoots and scores. This week’s three-course buffet comes with a cartoon, a short, and a feature guaranteed to get the viewer all jazzed up. Composer and trumpeter Shorty Rogers provides the backbeat for this real cool Looney Tunes reboot of the Three Little Pigs legend, featuring the vocal stylings of sly satirist Stan Freberg. Headliners at the House of Straw, our trio of in-the-groove swine are interrupted in mid-set by a big bad trumpet-splitting wolf. The cob-rollers aren’t the only ones who find his playing corny, as the audience breaks into a chorus of, “Throw the square out.” The only thing left for the wolf to blow is the house down. This atypical one-off, written by Warren Foster, remains one of the studio’s most memorable later period shorts. There’s even a kosher impersonation of Liberace! 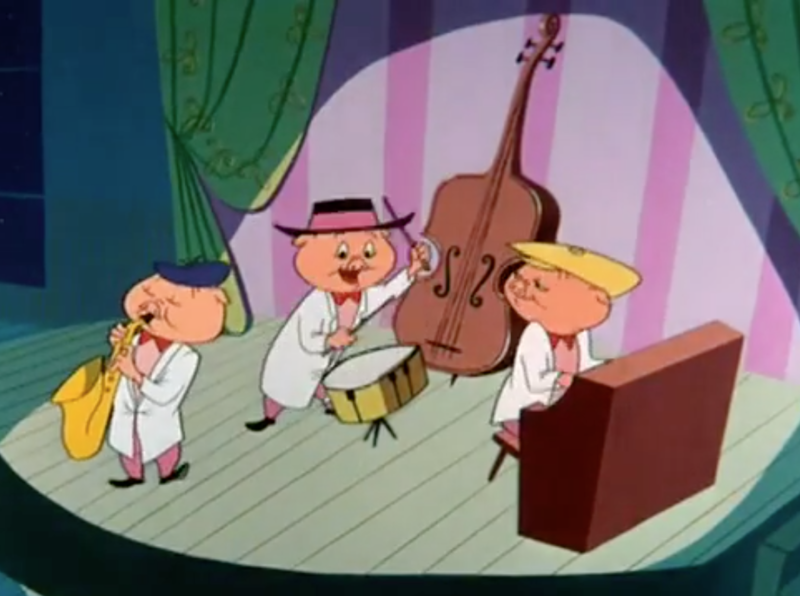 Another triumph for Friz Freleng, who, when it comes to musicals, was the most euphonic resident of Termite Terrace. 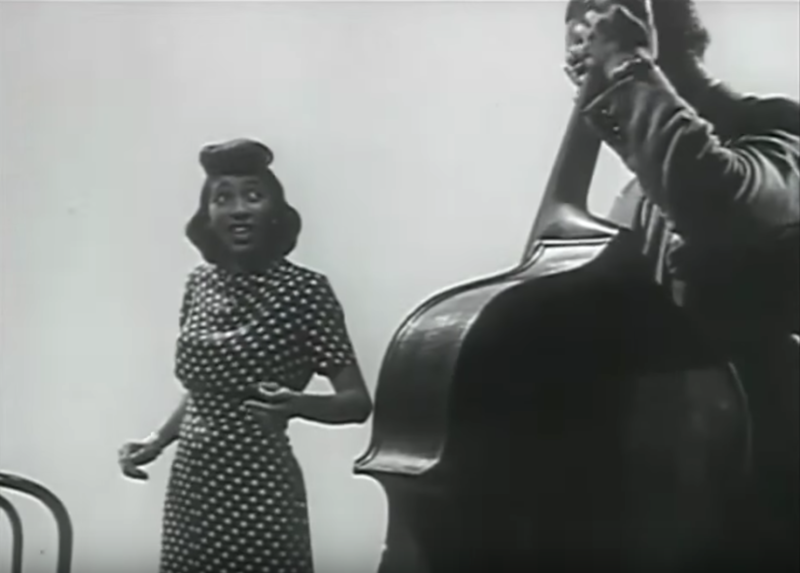 Years earlier, two of Rogers’ bandmates (George ‘Red’ Callender and Barney Kessel) played in a noteworthy Academy Award-losing short (see below.) Look for Bops in the invaluable Blu-ray set, Looney Tunes Platinum Collection: Volume 1. If not, sniff around Vimeo. Life Magazine photographer Gjon Mili’s one and only foray into moving pictures was this free-form all-black jam session, released towards the tail end of WWII, that earned him an Oscar nomination. (Mili lost to the singing cows spectacular Who’s Who in Animal Land.) Leaps and bounds ahead of its contemporaries, this visually innovative avant-garde film is by far the most unique musical short ever to come out of the Hollywood studio system. The talent roster boasts the likes of Lester Young, Harry “Sweets” Edison, Barney Kessel, Illinois Jacquet, and more. And it shares something more in common with our feature presentation than just a jazzy connection. Both were photographed by Hitchcock’s personal lensman, Robert Burks. Physical media aficionados can find it on the back end of Passage to Marseille as well as several jazz DVD compilations. Streamers: look no further than YouTube. 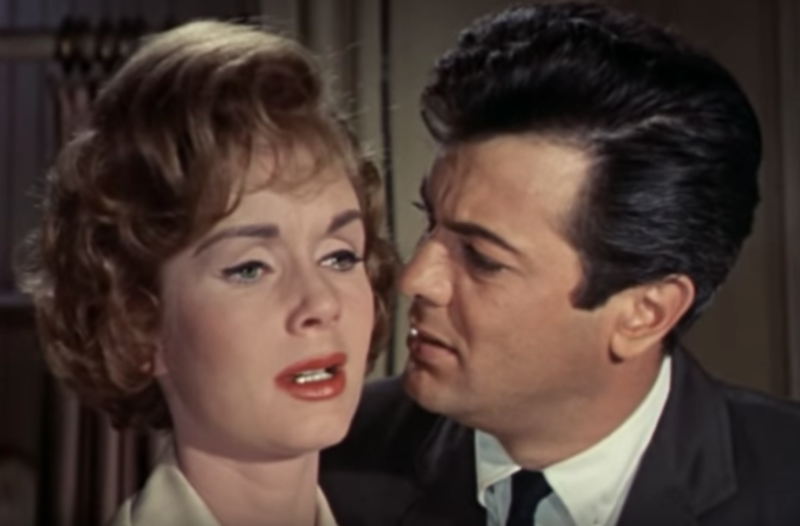 Dad puts son Tony Curtis on a New York-bound Greyhound, where the lad is confident that fame and fortune as a jazz musician are waiting at the depot to greet him with open arms. (Time spent the previous year blowing tenor sax for Sweet Sue and Her Society Syncopators must have bolstered his confidence.) First, he gets played into sharing a flat with taxi dancer Debbie Reynolds, never better than when in a state of “Don’t ‘f’ with me!” Then there’s a scheme cooked up by jazz legends Joe Bushkin, Sam Butera, and Gerry Mulligan to fly the coop with Curtis’ impressive stash of instruments. Instead of taking a bitter bite out of the Big Apple — a tip of the hat to Sultan of Set Design, Hal Pereira for his bustling backlot Paramount mock-up — Robert Mulligan (To Kill a Mockingbird, Summer of ‘42) infuses the romance with assured gentleness. Did I mention Don Rickles’ dramatic turn as a low-down pimp? One look and you’ll understand why he made it big as a comedian. The script was adapted by Garson Kanin from his Broadway hit; the driving score is courtesy of Elmer Bernstein.